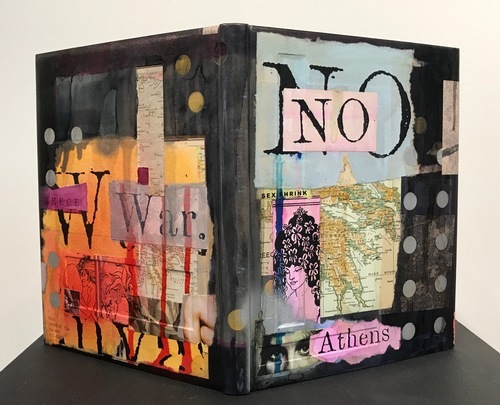 The Center for Book Arts (CBA) opens its latest exhibit this evening dedicated to the work of British artist and CBA faculty fellow Mark Cockram. Beyond the Rules includes examples of Cockram’s creative bookbinding and book artistry. His multi-dimensional, multi-textual book sculptures reflect Cockram’s all-encompasing fascination with the book as art object. “I work with the book,” Cockram said. “Within the book, an infinitely complex array of materials and techniques come together and combine with a history as rich and diverse as we who create and use it. I often refer to the book in its totality as Alchemy.” Adept at working with traditional bookbinding methods, Cockram will often modify or develop new techniques as each project unfolds, depending on how he feels the text would best be served by a particular binding. Recent work has led him to create art with “up-cycled,” or creatively repurposed materials. Though the exhibit itself only encompasses six books, each reveals Cockram’s careful consideration of both the textual elements and authorial intent. 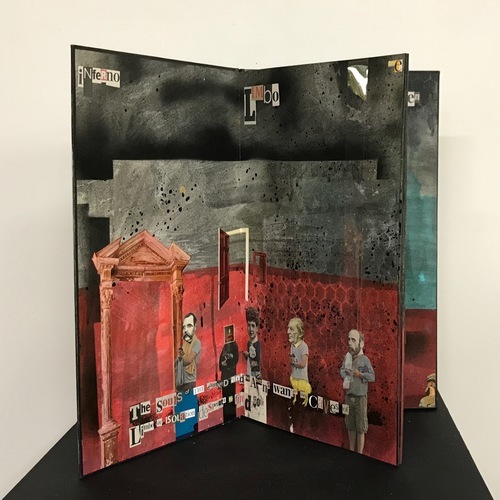 The eclectic list includes an art book inspired by The Divine Comedy, an homage to artist Joseph Cornell, and a reinterpretation of The Four Gospels. As a professional bookbinder, artist, and teacher, Cockram’s work has been displayed at the National Art Library at London’s V&A Museum, the Library of Congress, the British Library, the Grolier Club, and in private collections worldwide. Beyond the Rules, however, is Cockram’s first solo show in the United States. Beyond the Rules is on display at the Center for Book Arts through December 16. Also happening this weekend in Cambridge, Massachusetts: Nick Basbanes presents his observations from working with primary source material at the Longfellow House for his forthcoming dual biography entitled Cross of Snow: The Love Story and Lasting Legacy of Henry Wadsworth Longfellow. A cake reception will precede the lecture at 2 p.m, which will be held at the Sherrill Library at Lesley University on 89 Brattle Street in Cambridge. The lecture is free to the public. The Center for Book Arts (CBA) opens its latest exhibit this evening dedicated to the work of British artist and CBA faculty fellow Mark Cockram. Beyond the Rules includes examples of Cockram's creative bookbinding and book artistry. His multi-dimensional, multi-textual book sculptures reflect Cockram's all-encompasing fascination with the book as art object. "I work with the book," Cockram said. "Within the book, an infinitely complex array of materials and techniques come together and combine with a history as rich and diverse as we who create and use it. I often refer to the book in its totality as Alchemy." Adept at working with traditional bookbinding methods, Cockram will often modify or develop new techniques as each project unfolds, depending on how he feels the text would best be served by a particular binding. Recent work has led him to create art with "up-cycled," or creatively repurposed materials. Though the exhibit itself only encompasses six books, each reveals Cockram's careful consideration of both the textual elements and authorial intent. The eclectic list includes an art book inspired by The Divine Comedy, an homage to artist Joseph Cornell, and a reinterpretation of The Four Gospels. As a professional bookbinder, artist, and teacher, Cockram's work has been displayed at the National Art Library at London's V&A Museum, the Library of Congress, the British Library, the Grolier Club, and in private collections worldwide. Beyond the Rules, however, is Cockram's first solo show in the United States.